This is an annual event, and the general consensus was that this was their most successful event yet. 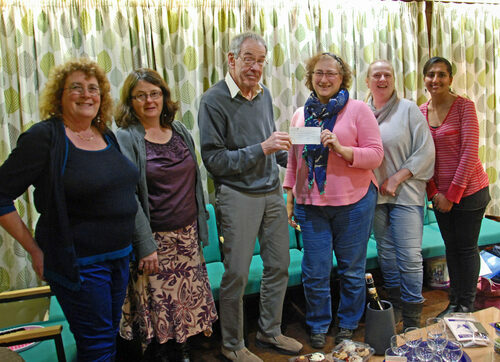 Catherine Wilkins of the Crafters presented Peter Hulbert of the Counselling Service with a cheque for £850 at the St Michael’s Community Centre on Wednesday March 6th. The funds were enhanced by Vodaphone giving a matching donation on the first £350 raised, making an overall total of £1,200. Peter explained how vital this support was, with Local Authority grants being withdrawn and the demand for counselling services growing. This will help us recruit more counsellors and provide around thirty more counselling sessions this year. SCS Supported by Berkshire Community Foundation! SCS was delighted to participate in the BCF Showcase Event on 7th of March and to be the recipient of a grant of £17,000 to further develop and consolidate the services offered by SCS. The funding has been made possible by funds raised through the BCF 2017 Year of Mental Health campaign. Speaking after the award was announced Mr Peter Hulbert, a trustee of SCS, said: " Many thanks, both for this most welcome award, which will totally underpin our plans to enhance and develop SCS over the next few years, and for the excellent work that BCF does in so successfully coordinating fund raising activities in Berkshire . Our team thoroughly enjoyed yesterday's event, notwithstanding the somewhat nerve-wracking experience of speaking against the clock, and the totally professional way in which the event was put together is testament to the hard work and expertise of you and your team." There are lots of pictures here.